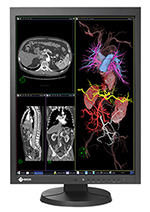 Hakusan, Japan, August 29, 2013 – EIZO Corporation (TSE: 6737) announced the release of the RadiForce MX215, a 21.3-inch color LCD monitor for clinical review. The RadiForce MX215 comes with an Integrated Front Sensor built into the monitor’s bezel, eliminating the need for an external calibration sensor. This dramatically reduces the time and effort needed to maintain quality control for optimal user settings, such as DICOM Part 14* international standards. In addition, EIZO’s Digital Uniformity Equalizer (DUE) function provides optimum backlight luminance uniformity which is considered difficult to attain due to the characteristics of LCD monitors. The technology counteracts fluctuations in brightness and chromaticity to ensure a smooth and stable image. The IPS panel has a wide viewing angle of 178° so images can be viewed by several people with minimal color shift. This combined with the monitor’s high contrast ratio of 1500:1 allows the RadiForce MX215 to provide users with the high level of image quality and detail essential for viewing medical images in clinical environments. The monitor is equipped with a highly efficient LED backlight which uses an average of 59% less energy compared to a monitor of the same size with a conventional CCFL backlight. This saves energy and cost while also achieving a high typical brightness of 420 cd/m2 for excellent visibility. In addition, the LED backlight is mercury-free to have minimal impact on the environment when disposed of. The RadiForce MX215 is designed for portrait mode utilization to support the considerable number of viewing applications that display medical images in this way for optimal clinical review. The OSD menu buttons and Integrated Front Sensor are also positioned to properly support portrait mode. The RadiForce MX215 is a medical-grade monitor that provides customer assurance by meeting the strictest medical, safety, and EMC emissions standards such as CE (Medical Device Directive). In addition, the RadiForce MX215 has obtained FDA 510(k) clearance for general radiography. The RadiForce MX215 is now shipping. Date of availability varies so please contact the EIZO group company or distributor in your country for details.